Ferrybridge Flood Lock Footbridge is a minor waterways place minor waterways place place on the waterways major waterways place village town city on the Aire and Calder Navigation (Main Line - Goole to Castleford) between Bank Dole Junction (Junction of the Aire and Calder Navigation (Selby Section) and the Aire and Calder Navigation (Main Line)) (1 mile and 4¾ furlongs and 1 lock to the east) and Castleford Junction (Junction of the Aire and Calder Navigation (Wakefield Section) and the Aire and Calder Navigation (Main Line)) (5 miles and 3¼ furlongs and 2 locks to the west). The nearest place in the direction of Bank Dole Junction is Ferrybridge Flood Lock No 10; ¼ furlongs away. The nearest place in the direction of Castleford Junction is Ferrybridge Weir Entrance (Channel leading to the Weir); ¼ furlongs away. 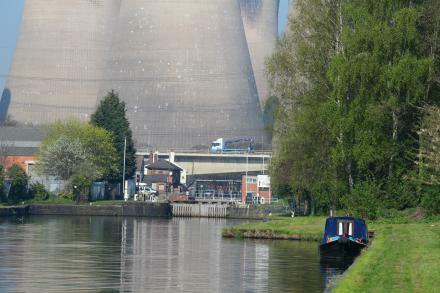 It's a very pleasant place to moor, even with the imposing Ferrybridge Power Station cooling towers. Mill View, Knottingley, WF11 8SR — 1003 yards to the southwest. Knottingley — 1545 yards to the north. 7 High Street, Knottingley, WF11 8NQ — 148 yards to the southwest. 8-10 High Street, Knottingley, WF11 8NQ — 203 yards to the southwest. Knottingley — 259 yards to the west. Knottingley, Knottingley — 262 yards to the west. Ground Floor, Velco House, The Square, Knottingley, WF11 8ND — 94 yards to the southwest. 21 Highstreet, Ferrybridge, WF11 8 — 183 yards to the south. Knottingley — 1436 yards to the northeast. Knottingley — 1000 yards to the southeast. Golden Lion, The Square, Ferrybridge, Knottingley, WF11 8ND — 214 yards to the northwest. Unit 6b, Ferrybridge, WF11 8NA — 261 yards to the northwest. Hilltop, Leeds, WF11 8 — 1125 yards to the southeast. Holmfield House, Stranglands Lane, Leeds, WF11 8SD — 1017 yards to the west. Pontefract, PONTEFRACT — 1637 yards to the southwest. Knottingley — 1030 yards to the southeast. Ferrybridge — 803 yards to the southwest. Ferrybridge, WF11 8QJ — 1050 yards to the southwest. Pontefract, WF8 — 1267 yards to the southeast. Leeds, WF11 8 — 1021 yards to the west. 11-13 High Street, Ferrybridge, WF11 8NQ — 160 yards to the south. 5 High St, Ferrybridge, WF11 8NQ — 142 yards to the southwest. 9 High St, Ferrybridge., Knottingley, WF11 8NQ — 152 yards to the southwest. VELCO HOUSE, FERRYBRIDGE WF11 8ND, Knottingley, WF11 8ND — 74 yards to the southwest. Old Great North Rd, Knottingley, WF11 8PH — 282 yards to the northwest. 1456 yards to the southeast. Unit 16 Clifton forge business park, Doncaster, WF11 8JB — 729 yards to the south. Unit 11, Ferrybridge Business Park, Fishergate, Ferrybridge, West Yorkshire, WF11 8NA — 413 yards to the southeast. Byram Business Park, Low Street, Brotherton, Knottingley, WF11 9HS — 830 yards to the north. Ferrybridge — 241 yards to the southwest. East Acres, Knottingley, WF11 9 — 1235 yards to the northeast. Seaton crescent, Knottingley, WF110HU — 1434 yards to the south. Pontefract, WF8 — 1331 yards to the southwest. 3 High St, Knottingley, WF11 8NQ — 148 yards to the southwest. Prestige kitchens & bedrooms marsh house, Knottingley, WF11 8PH — 246 yards to the west. the yard 10a hill garth knottingly, Malvern, WF110JZ — 1600 yards to the southeast. Unit 4b, ferrybridge business park, Doncaster, WF11 8NA — 154 yards to the southeast. Marsh house, old great north road, Ferrybridge, WF11 8PH — 205 yards to the southwest. Unit 8 Ferrybridge Business Park, Fishergate, Knottingley, WF11 8NA — 327 yards to the southeast. 2 High Street, Leeds, WF11 8PQ — 131 yards to the southwest. Knottingley — 92 yards to the east. 12 High Street, Ferrybridge, WF11 8NQ — 199 yards to the south. Clifton Forge Business Park, Forge Hill Lane Unit 10, Knottingley, WF118JB — 1107 yards to the southeast. The Square, Ferrybridge, WF11 8 — 104 yards to the southwest. Ferrybridge, WF11 8PH — 278 yards to the west.